One of the tasks that novice woodworkers struggle with learning is how to sand wood. Sanding can be a tedious process, but it is vital to the overall quality of the woodworking project. In the following articles, learn how to sand wood through a variety of methods, from hand sanding to using specific types of power sanders. Once you master these wood sanding techniques, you'll be able to prep your projects for a great finish. The first thing one needs to know when preparing to sand a project is choosing the correct sandpaper or sanding disks required to do the job. From specific grits to understanding the differences in formulations designed for hand sanding or high-speed abrasives, having the proper sanding "tool" is vital to the success of the project. Nearly every modern woodshop has at least one random orbital sander. The action of this sander helps eliminate scratch marks that can be created by hand sanding or with a repeating-pattern sander (such as a common sheet sander). In this article, learn the features you should look for when selecting a random orbital sander. Sheet sanders are sometimes considered an ugly step-child of the random orbital sander, namely because they use a repeating pattern to move the sanding pad. However, for many initial sanding tasks, a sheet sander is quite adequate. Additionally, a sheet sander can use a 1/4 or 1/2 sheet of regular sandpaper, making it far more economical than a random orbital sander (which requires specific sanding disks). Learn the advantages of a sheet sander and how to use one on your woodworking projects. For sanding curved cuts (such as those made by a band saw or jigsaw), few tools can equal the ability of the oscillating spindle sander. This specialty sander is essentially a drum sander whose spindle moves up and down as the drum spins. This oscillating action exposes more of the sanding drum to the wood, lengthening the life of the drum and reducing sanding lines on the wood. Learn the advantages of using an oscillating spindle sander, plus additional techniques for sanding straight cuts with this unique sander. After using progressively finer grits through the sanding process with your random orbital sander or sheet sander, the last step before ending the sanding process should always be to give the project a good once-over (at the minimum) hand sanding. Hand sanding for a perfect final touch allows you to fine-tune some spots that may need a little extra care, and eliminate any last little sanding marks caused by the power sander. Learn how to give a final hand sanding before moving on to finishing in this woodworking tip. While it may seem very basic and simple, the process of making sandpaper is rather technical and quite fascinating. We were able to take a tour of the Ali Industries factory, where we watched them make a variety of Gator Finishing sandpaper and other abrasive products. Seeing how sandpaper is made was a very enlightening experience, as well as seeing the step-by-step process of how sanding belts and sanding disks are manufactured. As with sandpaper, sanding belts have a specific formulation and manufacturing process that allows them to be durable, to stand up to the heat generated by the power of the belt sander. The belts are created from long strips of sandpaper designed to handle high temperatures, are then cut to width and taped together to form a loop. Follow along and see how sanding belts are manufactured. 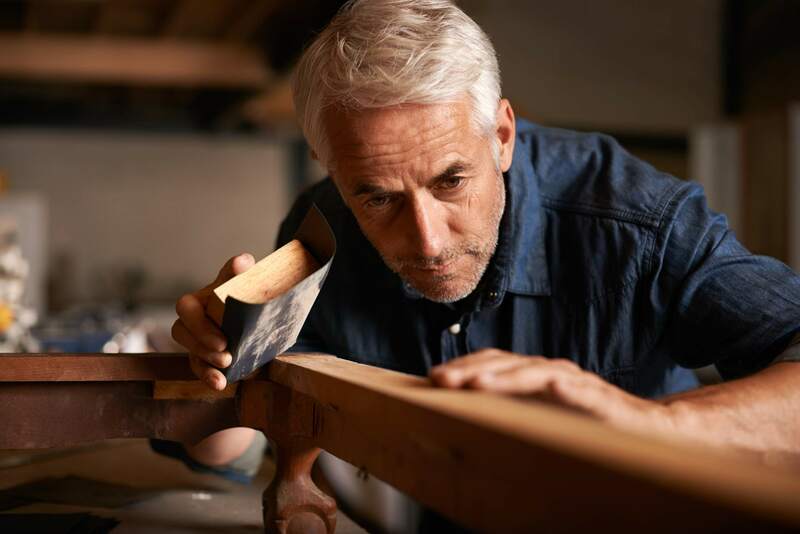 After sanding your woodworking project, you need to remove all traces of sawdust before you're able to apply the paint or stain finish of your choice. In this article, learn a tip for removing the final traces of sawdust from your project before moving on to the finishing step.